Chandigarh, March 27 2008: Fourteen-year-old amateur Ashbeer Saini emerged as the surprise package of round one of the Centurion Bank of Punjab Open. The Kapurthala lad shot a bogey-free 67 to grab a share of the first round lead along with seasoned campaigner Mukesh Kumar. Mukesh also shot a bogey-free 67. Vishal Singh was in third position, a stroke behind the joint leaders. 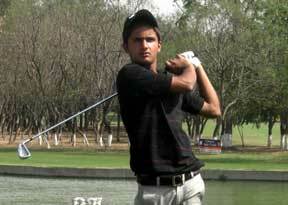 Vishal Singh shot 68 to be placed third at the end of round one. The professional from Jaipur sank birdies on the second, seventh, ninth, 13th and 14th and dropped a bogey on the eighth.Kapurthala’s Gaganjeet Bhullar, veteran Vijay Kumar and C Muniyappa from Bangalore fired rounds of 69 to be tied fourth.